I attempted Veganuary this year. I lasted three days. But the reason for my downfall was not the aching lack of bacon or creamy yoghurt, but milk. And, more specifically, milk in tea. Say what you will, almond milk just doesn’t taste the same. As I drink on average about five cups of tea a day, this was a bit of a problem. I have been trying to consume less dairy, so have almond milk on cereal, but I realised pretty quickly that completely cutting out dairy was going to be a challenge that I didn’t particularly want to deal with. Especially alongside dry January, which is going much better (apart from an ill-considered encounter with a boozy tiramisu, which I’m not sure counts). However, I am trying to eat more vegetables, and less meat. This seems to be more problematic for people to grasp than just saying you’re a vegetarian. I do eat meat, I’m just deliberately trying to eat less. I have recently found myself inadvertently cooking vegetarian and vegan food, as I’m focusing on vegetables as the centerpiece of the dish, rather than meat. 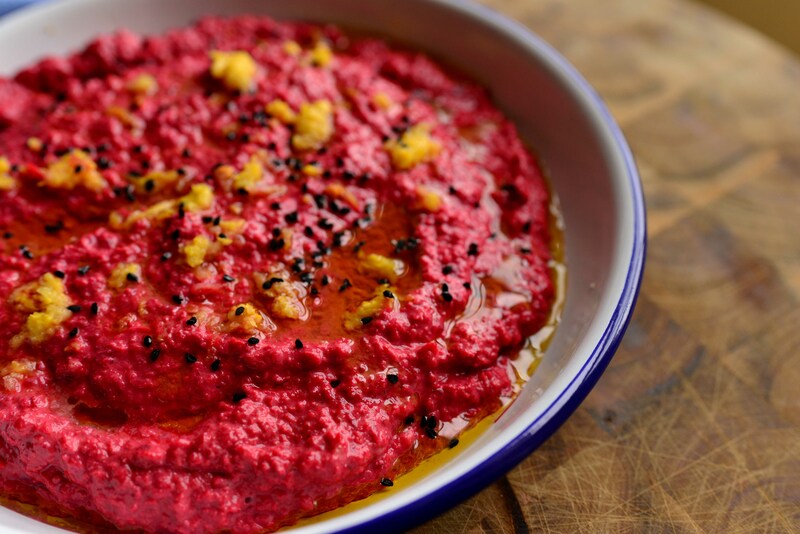 This beetroot dip is laughably easy, and a great way to shoehorn lots of raw veg into an easily digestible form. It can be eaten as it is, with toasted pittas to scoop it up with, or as part of a salad with some grilled halloumi, maybe. The nigella seeds (not marketed by Ms. Lawson, they’re also known as ‘black onion seeds’) are optional, as they can be hard to get your hands on. We found some and thought they’d act as a brilliant colour contrast to the vibrant purple of the beetroot. Click here for Paris’ take on the subject. 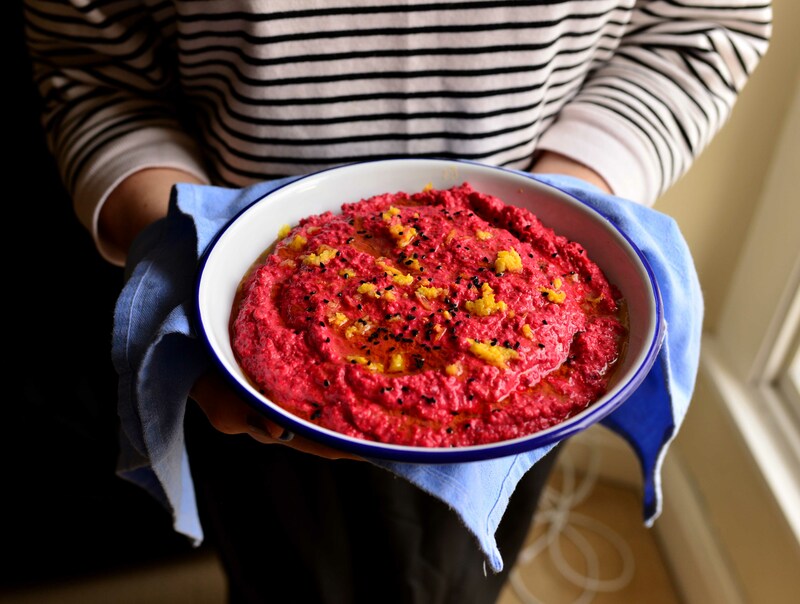 Put the grated beetroot, cannellini beans, lemon juice, garlic, tahini and olive oil in a food processor and whizz until smooth. Put in a bowl and drizzle with more olive oil and sprinkle over the lemon zest and nigella seeds (if using). Serve with warmed pitta bread for dipping. 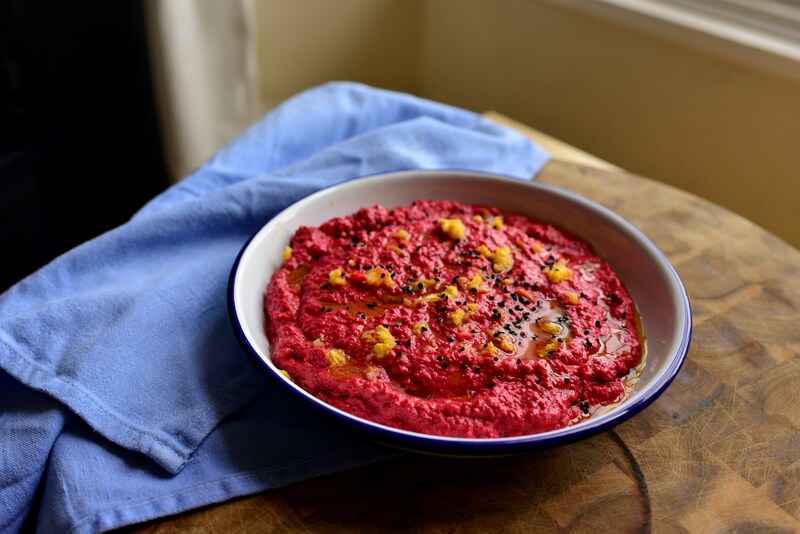 This entry was posted in Beetroot, Dips, Vegan, Vegetarian and tagged beetroot, cannellini beans, garlic, hummus, tahini. Bookmark the permalink.